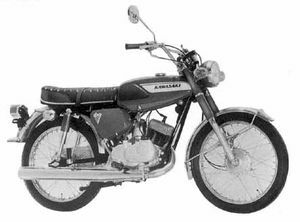 The Kawasaki GA5A was a 100cc two stroke, single cylinder street motorcycle manufactured by Kawasaki from 1971-1974. This was actually the upgrade from 90cc Kawasaki G5. It had a low exhaust typical of a street motorcycle. Horsepower increased from 10.5 to 11.5 HP. Remarks: Developed version of the GA2A. Design somewhat different.